Happy New Year to all in the UDCDA community! I am very excited about the direction our agency is taking as we begin 2019. 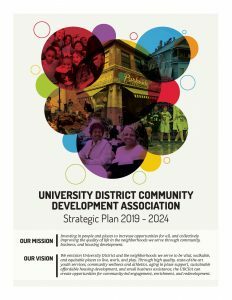 After more than a year of intense work by the UDCDA board, and a highly talented group of staff members, I am pleased to announce that a new, very aggressive Strategic Plan has been adopted to guide us into the future. This plan crafts a vision for how the agency will evolve, grow and develop over the next 5 years (2019-2024) alongside the community it services. It is the culmination of information we acquired through a community needs assessment where we heard from hundreds of voices, by examining our existing operations and by evaluating the progress UDCDA has made since the merger in 2010. In doing so, four main goals emerged as the basic elements of our Strategic Plan: Business Development, Affordable Housing, Public Spaces and Social Capital. By focusing on the expansion of these goals we hope to strengthen the organization’s traditional programs while exploring new area of opportunity. As we begin 2019 with high hopes for the community, I wish all of you peace, happiness and many blessings throughout the new year.